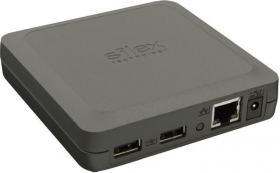 The Silex DS-510 is designed to easily connect and share USB devices over a network. Printers, Scanners, Disk Drives, Card Readers, or virtually any other USB device can now be enabled with network capability. It allows fexibility to place the USB device anywhere on the network instead of needing to be attached directly to the computer, and multiple users can access the USB device. High-Performance data throughput due to optimized performance and Gigabit connection: Extremely powerful CPU (800MHz) and two USB Hi-Speed ports (TypeA) Energy Saver Mode When the device server is not used for a certain period of time, the power supply to the USB bus is turned off to save energy. The power supply to the USB bus is automatically turned back on when the server is used again. The Printer AutoConnect feature works with the Windows or Macintosh printing system and allows multiple computers to easily share USB printer over the network by making an automatic connection to the printer. Then it will automatically disconnect after the print job is sent making the device server available to the next user.